Help us celebrate the 20th anniversary ride. Register online. Each year 100-150 wonderful people volunteer to help with the Pumpkinvine Bike Ride. Our volunteers are actually a highlight for our riders because they are so friendly and helpful. We receive comments praising them from ride participants. If you’d like to add your name to our possible volunteer list, go to this webpage to complete a form (one per person). ride.pumpkinvine.org/volunteer. You might not hear back from us right away, but we greatly appreciate your willingness to help out. Work on closing the gap in the Pumpkinvine Nature Trail between County Road 33 and County Road 20 began at the end of July, 2018 and the bridge across the south fork of Pine Creek was finished during the winter by Yoder Construction. Pulver Asphalt and Paving, Albion, Ind. has resumed construction on the remainder of the trail and expects to finish by the end of May. Read the entire article. Five volunteers who are employees at Lippert Components donated their time to plant 27 cedar trees along the trail between County Roads 35 and 37. A few children accompanied their parents and helped with the work. Northern White cedar trees are uncommon in this area but they thrive here. They are evergreen adding attractive color throughout the year. Friends planted cedar trees a short distance east of Middlebury in 2001 before the Pumpkinvine Nature Trail was built. Today the trees are 15 to 20 feet tall and add variety to the natural scenery along the trail. Elkhart County Convention and Visitors Bureau created a booklet with maps, photos and descriptions of eleven walking and bicycling trails. The booklet has urban trails such as the Elkhart River Walk Trail as well as longer ones such as the MapleHeart Trail and the Pumpkinvine Nature Trail. The West County Tour lays out a 33-mile route on county roads and explores the country towns Wakarusa and Nappanee. The Goshen-Bonneyville Link, 12-miles one way, uses the Pumpkinvine Nature Trail and county roads to reach the Bonney Mill County Park. The the entire booklet titled Biking and Walking in Elkhart County is available for download in pdf format. Download a Pumpkinvine Trail map in pdf format. Friends of the Pumpkinvine Nature Trail are registered to receive rewards through the Kroger Community Rewards Program and AmazonSmile. If you want to help step by step instructions are available here. A Pumpkinvine Nature Trail brochure is available for download. 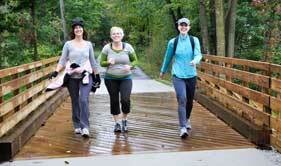 Enroll your business to become a Pumpkinvine Nature Trail sponsor. For more information download Corporate Sponsor Opportunities: 2019 Levels of giving and Associated Benefits for 2019, in pdf format. A report from the Eppley Institute study is available for download.